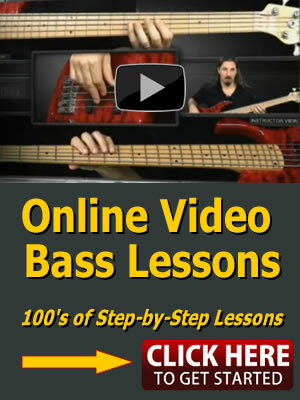 The first notes you want to get to know on the bass are the open strings. The 4th string is the lowest sound string (closest to the ceiling), and the 1st string is the highest sounding string (closest to the floor). After the open strings, the next step is to learn the names of the natural notes on the 4th and 3rd strings. The notes on these string be will be your anchor for many different common scale and arpeggio shapes you will need to create bass lines. That’s not to say that the 1st and 2nd strings are not important. It’s just that the 4th and 3rd strings are more important at first. All natural notes (A B C D E F G) are a whole step (2 frets) apart, except between E-F and B-C which are a half step (1 fret) apart. *Although it may seem stupid, make sure you know the 1st 7 letters in the alphabet forwards and backwards easily. Most people have a little trouble with the backwards part. (This is not something that Barney teaches) Once you reach G in the musical alphabet, you start over again with A. Below is a chart of all of the natural notes on the 4th string of the bass. The best way to memorize the natural notes on any string is to start out just playing (and naming) a few notes and progressively adding 1 note at a time. (e.g. play E F G E G F G A F A B F G B C etc…) If you do this a little each day, you can learn the notes on the neck quickly. Below is a chart of all of the natural notes on the 3rd string of the bass. Go through the same process as the 4th string. After learning the natural notes on the 3rd and 4th string, do the same on the 2nd and 1st. Below are some charts with the names of the notes on the neck of the bass.